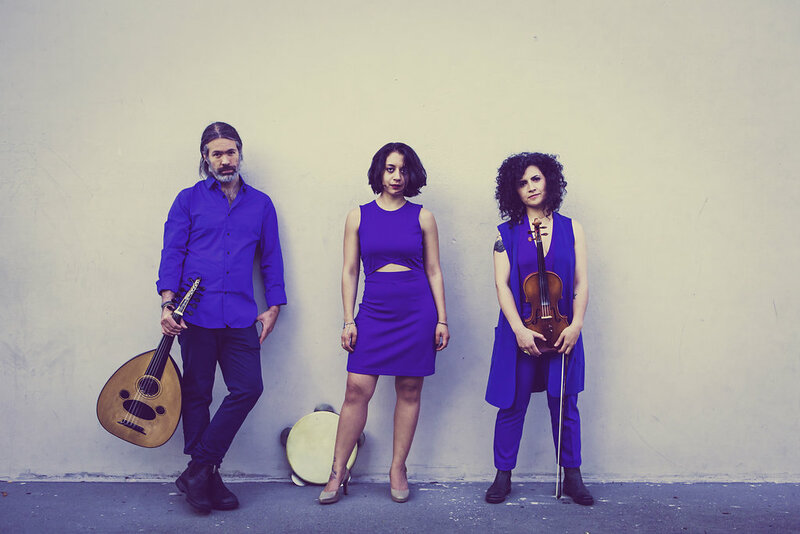 At turns romantic and elegant, vivacious and playful, the music of Çesni Trio is grounded in the flavors (çeniler) of Turkish makam music while remaining deeply personal and contemporary. The trio guides listeners from dove-tailing contemplative melodies to odd-metered tunes that throw caution to the wind. Tev Stevig (tanbur, oud, fretless guitar and alterna-telli) and Michael K. Harrist (yayl tanbur, double bass, ney and voice) first met in Istanbul in 2010. Back home in Boston, MA they found themselves playing and studying Ottoman art music together in Orkestra Marhaba. As an idea for a trio began to take hold, the group found kinship with Fabio Pirozzolo (darbuka, riq, bendir, tombak, davul) and Çesni Trio was born. The ensemble is excited to release its first full length record titled The Fluid Score in late April. With a musical vision that is at once ethereal and grounded, Dolunay flirts with the soundscape of the ancient Ottomans, tracing its migration through Balkan villages, coaxing it across seas and oceans, and grafting it onto a Brooklyn-based backdrop. The trio infuses classic and contemporary traditions with an urban grit that can only be found in New York City’s confluence of musical and cultural fhttps://www.tevstevig.com/cesni- trioorces. With an array of original compositions offered alongside renditions of Turkish and Rumeli standards, the music of Dolunay (Turkish for full moon) offers listeners an escape from the press of city life. The ensemble consists of Jenny Luna (voice and percussion), Adam Good (oud), Eylem Basaldi (violin).